“Americana” is most accurately defined to and understood by the general public as “Apple Pie and Baseball;” two things inseparable from the image of what it means to be American. Take that one level further, and a new phrase comes to tongue, one which in our industry is synonymous with repeatable perfection – the National Standard, or better yet, American Legacy. Phraseology like this is where American history makes note of muscle cars, Rock n’ Roll, and John Moses Browning’s pistol model of 1911. Keeping true to form, Cabot Guns have created the American Legacy Matched Pistol Set, befitting of the most American of no-nonsense personalities. 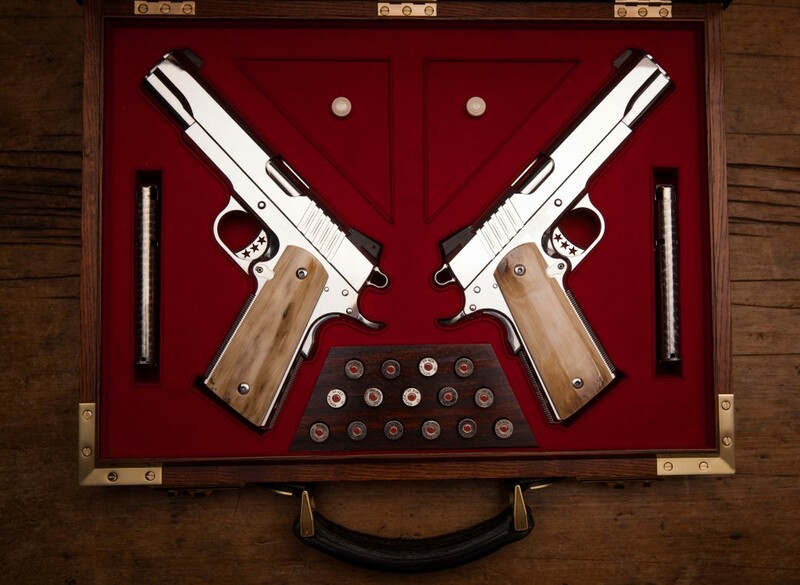 A perfectly mirrored and matched pair of our Deluxe model pistols, this matched set was custom crafted to embody perfection and performance for a customer who expects nothing less. The American Legacy is an investment-grade offering of Cabot perfection; American hot rolled stainless steel is transformed to frame and slide, and is finished to a polish of two-micron reflective quality. Put two of these exquisite incarnations of true Americana together, and you have the American Legacy Matched Pistol Set. 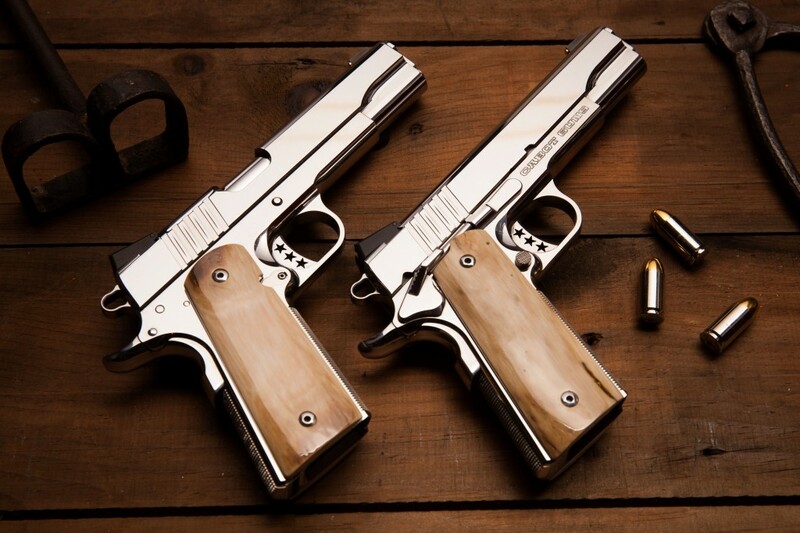 Peer into the better-than-mirror finish of hand-polished perfection wrapped around these pistols and they’ll stare right back at you, refusing to back down and goading you to lay hands on their ancient Alaskan Mammoth-tusk Ivory grips. As with any Cabot Gun crafted under our eye for detail and, form means nothing if function doesn’t precede it, and function this set will. True reverse-images of each other in every respect, these pistols are adorned with mirrored controls and features suited to the dual-wielding shooter. On close inspection it’s evident that even the rifling twist within their barrels has been perfectly reversed, complementing the left and right and ensuring that the operator may fire without having to chase shots. This level of detail is again evident as the eye is drawn to the micro-serrations precision ground into the space between each cocking serration astride the rear of the slides. At a width of only ten-hairs, and gracefully dipping to a midpoint depth of three and a half hairs before curling back to zero at each end, these minute testaments to detail oriented obsession subtly aid the shooter in establishing a positive cocking grip, and add elegance to the hard edged functionality of their larger counterparts. What better method to preserve and display these iconic images of American art-in-action than a custom fitted case created solely their artful display. 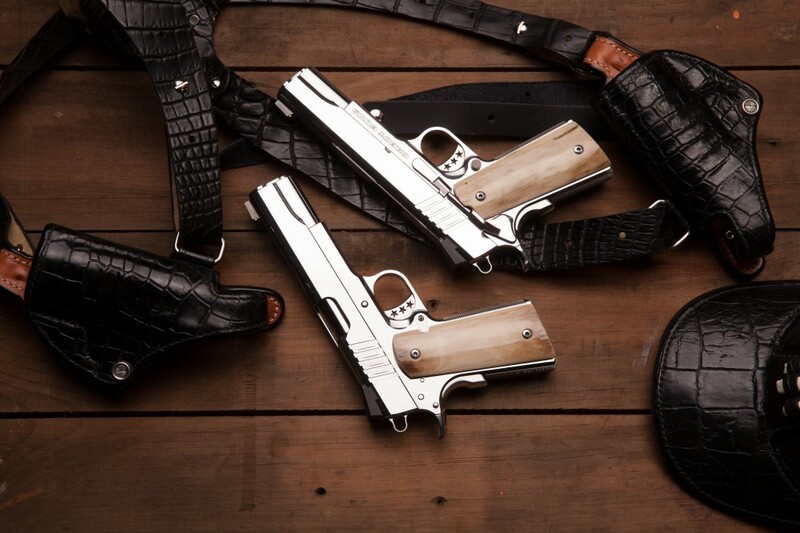 Crafted from the frame up by American master case maker Marvin Huey, the Alligator wrapped French-fitted case cradling these pistols is bestowed a unique serial number – mating it forever to the American Legacy Matched Pistol Set. For the days when these masterpiece arms venture out carried under the arms of a proud owner, exotic holster maker Sam Andrews has created a matching holster designed to hold left and right strong, true, and at the ready.